First, attach the ICCB2228 (Information center - base unit) to the wall. Then, take the JKWM2228 curved poster holder and slide it into the channels of the infomation center over the corkboard. Remove clear lens overlay from frame using thumb slots on sides of the lens. Place graphic behind overlay. Push one side of lens and poster under lip of side channel of frame. Repeat for other side. Fill acrylic holders with magazines, catalogues, promotional literature, or 8.5" x 11" flyers. 1. 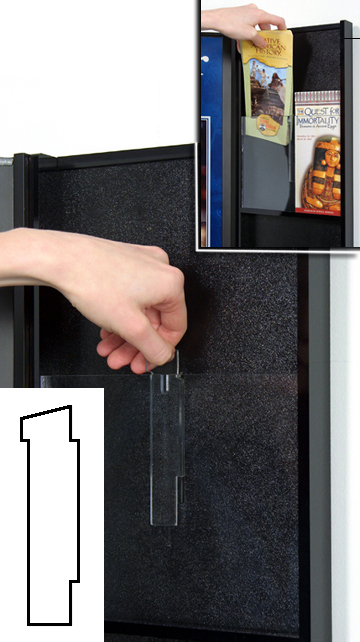 Hold the acrylic divider at a 45 degree angle to the black panel. Slide tab into the cutout behind the acrylic retaining pocket. 2. Using a steady motion, bring the acrylic divider piece perpendicular to the back panel and the retaining pocket while pushing downward. The divider tab will hook into place. 3. Fill info center with your brochures or pamphlets.